Alison trained at Walthamstow Art College and was an Art Teacher in Redbridge for a couple of years. 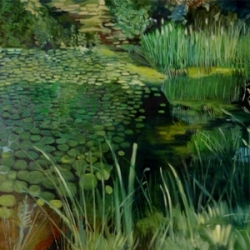 She has been painting consistently throughout the years and has exhibited widely and often, both locally and in Central London. Her paintings are in several private collections and, encouraged by…Show more her growing reputation, thirteen years ago she became a full-time Artist. "There is a wonderful sense of light within these forest landscapes which bring these paintings to life. " Stay in Touch with Alison! "Follow Alison to receive first access to new works for sale and the latest updates on events and activities."